No humidity levels that make me turn on my air conditioning just to cut through it. Crisp fall smells every morning (not necessary, but strongly recommended). Anyhoo, my weather rant is over for today (I think). Basically, this last week I’ve been trying to will the weather to be what I wanted it to be which is cool, slightly overcast yet not dreary. The type of weather that invites a light jacket and pumpkin spice latte without sweat running down your face. No one wants to sweat into their latte, trust me. In attempts to drum up some cool breezes, I decided to make a rich and bubbling Chicken Pot Pie. To up the fall-ness of it a bit more, I threw in some diced up sweet potatoes, but you could easily add cubed up butternut squash instead. I took some help from a store bought pie crust, because frankly, it was a weeknight and I didn’t feel like cleaning my food processor after making pie dough. That’s just me. If you feel like whipping up your own dough, go right ahead! It’ll be delicious, I’m positive of that. So, if you’re like me and want to invite the cool weather to get here already, this Autumn Chicken Pot Pie is the ticket. Also, my kiddos inhaled it so that made me feel pretty great. Especially after the Cornbread Bite experience. In a large pot, melt the butter over medium high heat. Add onion, carrot and sweet potato. Cook until soft, about 8 minutes. Add garlic and cook until fragrant. Add flour, and stir until vegetables are coated. Slowly add broth to the pot, whisking to create a smooth sauce. Add thyme and chicken bullion. Bring to a boil, and reduce heat to a simmer, stirring frequently. Simmer for about 5 minutes or until sauce is nice and thick. Stir in chicken and peas. Pour mixture into a 2 quart casserole dish. On a slightly floured work surface, roll pie crust slightly to fit the shape of your casserole dish. 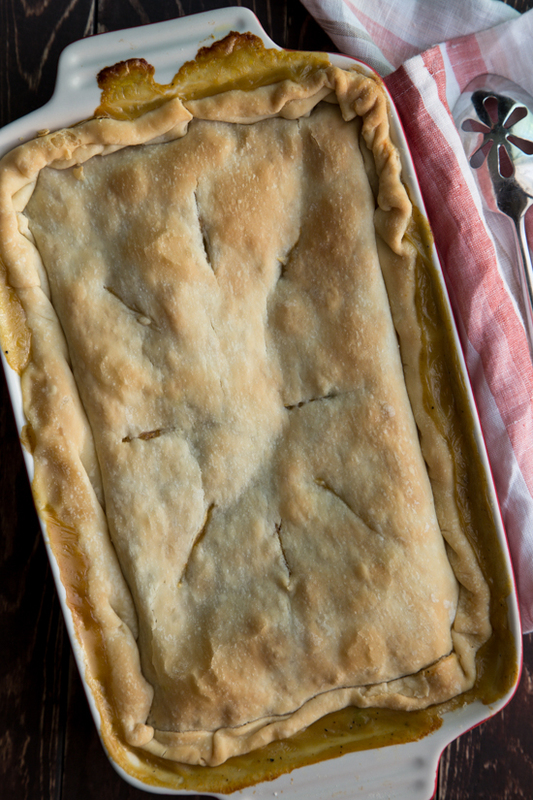 Place crust over casserole dish, folding overhang inward and crimping the edges. Cut several vents in the top of the crust. 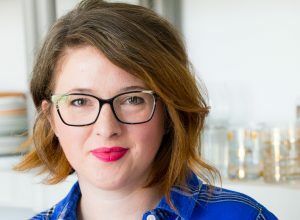 Place casserole dish on a rimmed baking sheet and bake for 35-40 minutes or until crust is golden and filling is bubbling. Allow to cool for 10-15 minutes before serving. Use any chicken that you like. Most recently, I used 4 chicken thighs that I roasted at 375 for about 30 minutes. I have also made this recipe using chicken from my basic roasted chicken breast recipe. You could also use leftover chicken from a market rotisserie chicken. Chicken Pot Pie is one of my favorites!! This is gorgeous. 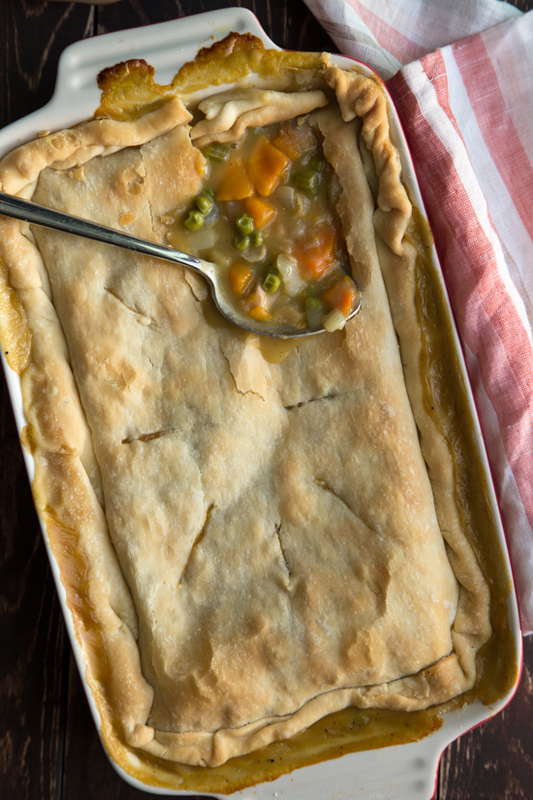 No matter the weather or season, I am such a fan of pot pies. This looks so delicious Emily. 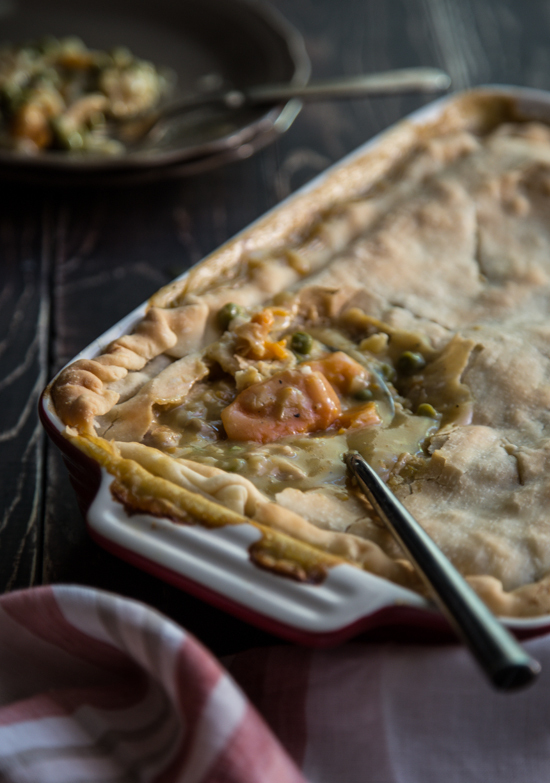 I think chicken pot pie is the best comfort food ever and I love the fall twist you put on it! Thanks so much, Gaby!! I agree, anything in ‘pot pie’ form is ok in my book 🙂 Thanks so much for stopping by! that looks amazing! it’s cold here and that would be so comforting now! I loved your recipe! I made it into mini chicken pot pies and it was delicious 🙂 Thanks! I’m so glad you liked it, Colleen! I was so torn because I wanted to make these into mini pies (I’m a bit obsessed with individual anything) but in the end made it one large pie. I’m so glad to hear that it worked as minis! This is EXACTLY why I love this time of year… comfort food to the max! Love it! Tried this last night and it was delicious!! Thank you so much for the recipe!!! Awesome, Nicole!! I’m so glad you liked it 🙂 I’m totally in need of making this again, especially with our super cold weather we’re having this week. Thanks so much for stopping by and if you are anywhere really cold, stay warm! !